Yoga nidra is a pratyahara technique that helps free the senses and achieve deep relaxation. It’s the fifth stage of the 8-fold path of raja yoga, which was described by Patanjali in his sutras. It was created by Swami Satyananda Saraswati, who modified an ancient tantric technique called nyasa, which involves the rotation of consciousness in the body and the mental placement of mantras on each part of it. 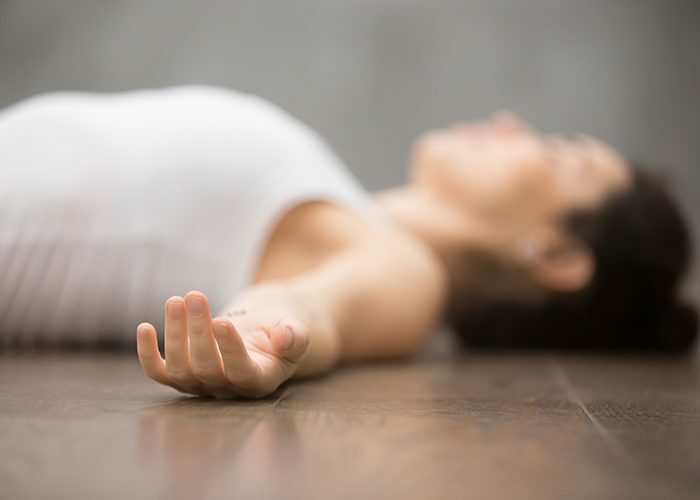 Nidra is practiced in savasana, the “corpse pose” of total immobility. The trainees follow the trainer’s instructions and stay alert during practicing nidra. Yoga nidra brings us to a state of deep relaxation, right before sleep. At this stage, the human brain sends out Theta waves and then Delta waves (deep sleep). While practicing yoga nidra, the brain sends out Alpha waves, thus being in an alert state, allowing access to our subconscious and resulting in the releasing of repressed emotions that were bottled up inside. With yoga nidra practice we are revitalized on a physical level, because we achieve deep relaxation, release stress, excrete toxins, heal trauma and negative beliefs on a mental and emotional level, giving our life a different meaning.